Taking his cue from the First Reading of the Day, the Pope noted that St. John the Apostle speaks of “worldliness” when he says that “whoever is begotten by God conquers the world”. He explained that this refers to our everyday struggle against a worldly spirit that is deceitful and lacks in consistency while “God’s spirit is truthful”. “The spirit of the world is a spirit of vanity, of things that have no strength, no foundation and that are destined to fall” he said. 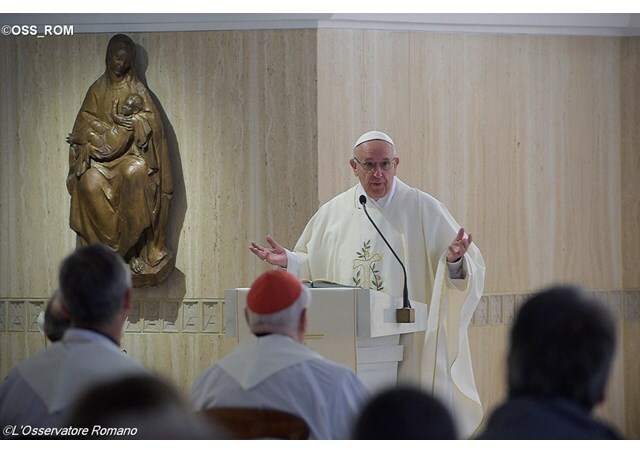 The Pope said the Apostle shows us the way reminding us that if we go by God’s spirit, we will do good things. Concretely, he says that “If anyone says, ‘I love God’ but hates his brother, he is a liar; for whoever does not love a brother whom he has seen cannot love God whom he has not seen”. “If you are unable to love something you see” the Pope explained, “why would you love something you do not see?” Describing this as fantasy, he urged us to love “what you see, what you can touch, what is real. Not the fantasies that you do not see”. Francis also said that if one does not show his love for God in a concrete manner, it is not true love. He then spoke of the spirit of the world which he said can be divisive and create splits in families, communities and society. “When divisions multiply they bring hatred and war” he said. Pope Francis went on to dwell on three signs that indicate that one does not love one's brother. The first, he said, is actually a question we must all ask ourselves: “Do I pray for others? For those whom I like and for those whom I dislike?”. The second pertains to feelings of envy and jealousy and wishing someone ill: “Don’t let these feelings grow” he said, “They are dangerous”. The third, he said, has to do with engaging in chatter - or gossip – that is harmful to others: “If I do this” he said, “I do not love God because with my words I am destroying another person”. Pope Francis concluded saying that the spirit of the world is conquered with the spirit of faith: believing that God is really in the brother and sister who are close to me. Only faith, he said, gives us the strength to tread the path of true love.